I have officially started getting into the Holiday Spirit. I LOVEEEEEEE Thanksgiving and all of the food that goes with it. Naturally, when introduced I took to the idea of Friendsgiving like a duck on water and have been a happy participant ever since! Over the next few weeks, the color palettes are going to double as holiday party inspiration. This week I’m looking at some traditional color themes for Friendsgiving Decoration Inspiration. 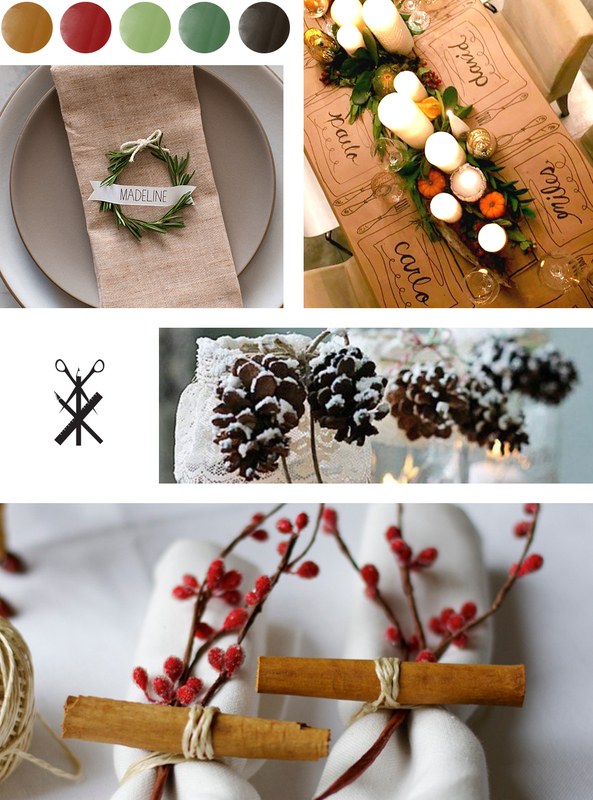 Friendsgiving Decoration inspiration is always fun to put together because you can go so many different routes. This week’s inspiration is very traditional and full of both fall & winter vibes. I like the idea of keeping things relatively simple. I love the centerpiece shown on the top right, but for Friendsgiving I think I would tone it down a smidge. The Rosemary Wreaths found over on Spoon Fork Bacon would make awesome drink markers. Spread across the table a la confetti would be a super cute alternative, too! Spread them across a butcher paper tablecloth with the names of your guests OR if you are less formal, write the names of the food being served and you have a pretty snazzy table set up!